Image size: 16"w x 12"h.
The Sikorsky UH-60 Black Hawk is a twin-turbine engine, single rotor, semi-monocoque fuselage, rotary wing helicopter. The medium-lift utility or assault helicopter was the winner of a United States Army competition in the late 1970s to replace the Huey (UH-1) family. Although the two final competing designs were both developed to Army specifications, the UH-60 was selected over an entry from Boeing-Vertol. It would go on to serve as the basis for variants in service with other branches of the US military. The Black Hawk can perform a wide array of missions, including the tactical transport of troops, electronic warfare and aero medical evacuation. In air assault operations it can move a squad of 11 combat troops with equipment, with advanced avionics and electronics provide increased survivability and capability. 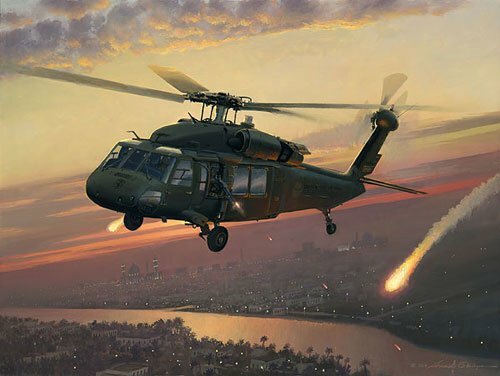 In William S. Phillips' "Returning Fire," the Black Hawk crew assigned to the 101st Airborne takes evasive action and releases flares and machine gun fire after being fired upon during a sortie late in the day over Iraq.